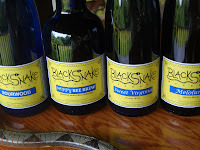 While attending FloydFest in southwest Virginia I wanted to take the opportunity to visit a few wineries and the first on my list was Blakesnake Meadery. The meadery had assisted us in an early article on Honey Wine and Colony Collapse Disorder so I wanted to pay our respects. Fortunately we called ahead and learned the owners, Steve and Joanne Villers, were also attending FloydFest, but they graciously arranged an early morning appointment. 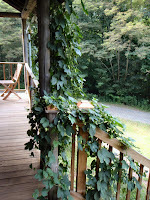 The couple started the meadery a few years ago as an excuse to spend more time in the beautiful Blue Ridge Mountains. Steve had many years experience home brewing beer – but a brewery was not commercially viable – neither a traditional vineyard. The next alternative: honey wine. They researched the process, purchased hives and started storing honey; all the while, keeping their 9-5 jobs a hundred miles away in Roanoke. On weekends they returned to the meadery to monitor the bees, ferment the honey, bottle the mead, and every other task required for a family operated business. 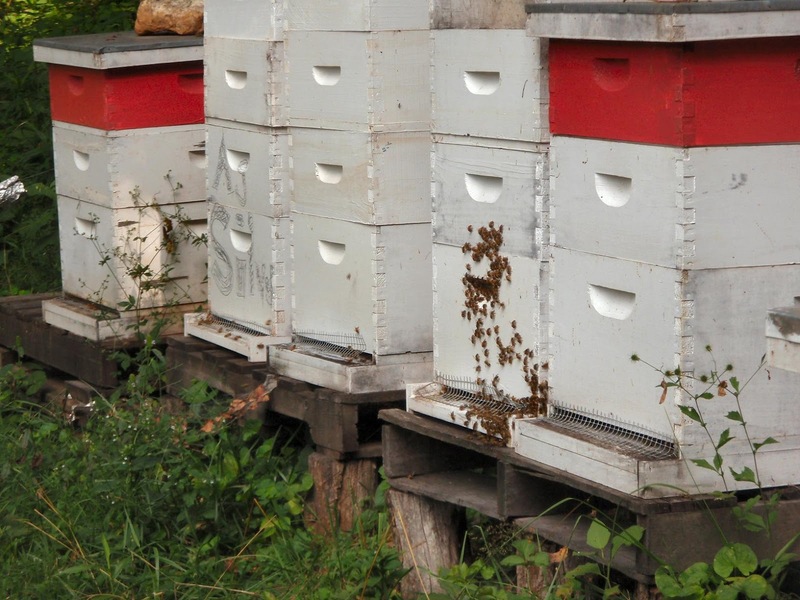 Slowly the business grew to where today they possess 16 hives that produce close to 800 pounds of honey. Since approximately 2 lbs of honey is required for each bottle of honey wine – that’s about 30 cases worth. To increase their stock, they purchase varietal honey such as Tupelo and Sourwood. But their local honey should be excellent; the country roads leading to Blakesnake are lined with miles of wild flowers in which the bees feed. When I arrived the Villers were waiting on their porch with their four current offerings ready: Sourwood Honey Wine, Bee Brew with Hops, Sweet Virginia and Meloluna. Blacksnake Meadery is located too far north for Sourwood trees to grow – but sourwood honey is a popular southern varietal available in neighboring Patrick County. As its name implies, it is a little sour and the wine is made bone dry at 0% r.s. Initially I was unsure whether I liked it, but slowly it has grown on me. Sometimes I cheat and add a little Barenjager; but alone – it reminds me a little like a hefeweisen, which leads into the next offering: the Bee Brew with Hops. Immediately this was my favorite – refreshing and clean. The concoction is made by boiling their wildflower honey with cascade hops and adding a small amount of carbonation from bottle conditioning. The result: refreshing pale ale. The aroma is awesome – pure hops. This may become the alcohol of choice after mowing the grass. 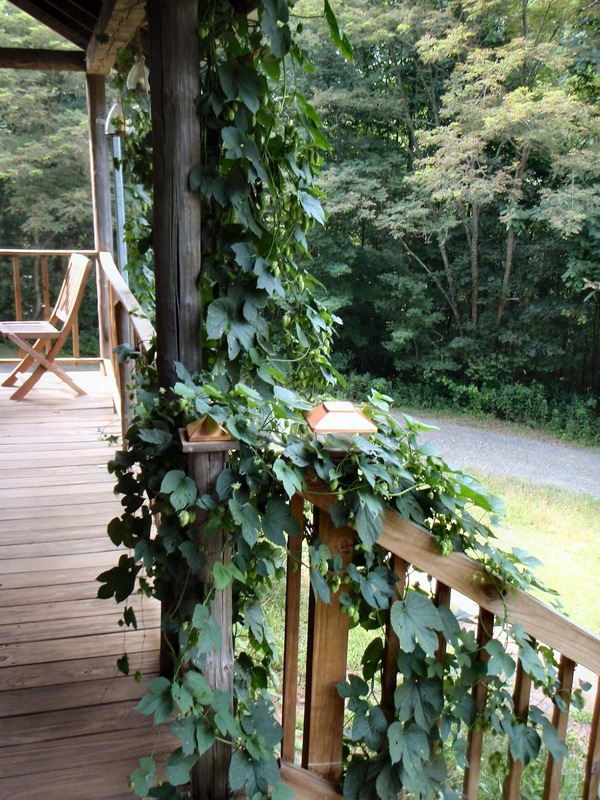 And with the goal of being self sufficient, the Villers planted hops which snakes across their porch – adding more charm to their meadery. Next was the Sweet Virginia, made in the traditional mead style and diluted with mountain well water. This is a perfect mead – pure honey flavors and aroma – and not gritty sweet at 6% r.s. It also pairs well with food – we tried it with burgers and chicken – but the meadery recommends game. No matter – it’s good. Finally Blacksnake produces a dessert style mead at 12% r.s. – the Meloluna. This is great alternative to the pricey late harvest or ice wines and since it’s made in the same fashion at the Sweet Virginia, it’s the same wine – just sweeter. 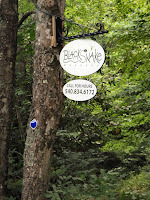 Regrettably Blacksnake Meadery is isolated from major population centers, but for those travelling the Blue Ridge Parkway, the meadery is only a short detour. 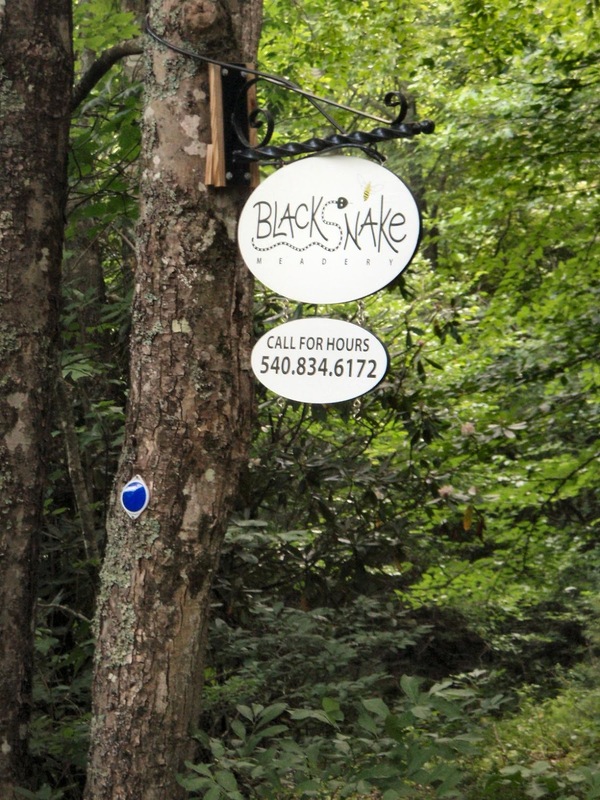 Blacksnake is also a member of the Blue Ridge Wine Trail so Blacksnake can be included in any tour of the local wineries and cider mills. We look forward to our next visit to Floyd – to listen to excellent music with mead. Thanks Jo and Steve. While passing through Lexington, we took the opportunity to visit another recently opened winery in Virginia, Lexington Valley Vineyard. The Hale family had been growing grapes on the property since 2000 and selling the produce to neighboring Rockbridge Winery. However, several years later, as time permitted – from commuting to the University of Missouri – they decided to proceed to the next stage and produce wine under their own label. The winery’s expertise is with Norton – which is not unexpected since Virginia and Missouri are the two most popular areas growing this variety. And with Mr. Hale’s work at U of M in Columbia, he has access to learn the techniques from several of the leading Missouri wineries. The other wines offered by the winery are white wines made from French-American hybrids. These grapes are hardy enough to withstand the Shenandoah Valley weather. After driving along several winding roads, we were surprised to see several other vehicles already at the winery. For a Friday afternoon we thought that we’d be alone. But no, one group was just starting a tasting and another was lounging with a pitcher of Sangria on the deck. We started with their Vignoles, which is made dry – but contains a strong pineapple flavor with major acidity. It almost felt like a sparkling wine – and could be why it is the main ingredient in their homemade Sangria. This is a good – summer wine. Next was their Vidal Blanc – a little sweeter than the Vignoles – and with more of a grapefruit flavor. We still preferred the Vignoles. We next tried a very unique wine, maybe the only rosé styled wine made in Virginia using just Norton. It is made off-dry and recommended served chilled. It is fruity and when served chilled – refreshing. We liked this wine – basically in summer drink the rosé and in winter, the two Norton varietal wines. 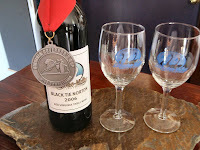 Speaking of these two, the Black Tie Norton is blended with Cabernet Sauvignon and was awarded a Silver Medal - 2007 Virginia Governor's Cup. It is a full bodied wine with spicy tannins – but the traditional Norton fruity taste. The 100% Norton is as full-bodied with a string black cherry flavor and a smoother finish than the Black Tie Norton. I guess being purists, we preferred the Norton over the Black Tie Norton – obviously others with a stronger wine pedigree disagree. We stayed a little longer at Lexington Valley than we had planned – because it was so relaxing. When sitting on the deck, the vineyards spread out in the distance, with hawks flying overhead, honey bees buzzing among the clover, and humming birds feeding on the deck. We could have stayed for hours – drinking the Vignoles, Chill Rosé, or the Sangria. However, Floydfest was in full swing and we had to move on. Currently their wines are sold exclusively from the tasting room and they are not participating at the numerous Virginia festivals – there is no one available to cover the tasting room. We recommend a visit. Being regular sparkling wine drinkers, we had neglected this style since our excursion to J Vineyards. We decided to head directly to Mumm Napa, where we knew a wide array of sparkling wines would await us. We had tried several of these wines at this year’s South Beach Wine & Food Festival and thought that many of their wines were great values priced at $20. In 1979 Guy Devaux was sent by the French Champagne house, G.H. Mumm, and its parent Seagram to seek a location to grow and produce sparkling wines using traditional Champagne grapes (Chardonnay, Pinot Noir, Pinot Meunier) and traditional processes: methode champenoise. He settled in Napa Vally and established Mumm Cuvee Napa, which became operational in 1986. Currently Champagne born winemaker Ludovi Dervin carries on this tradition, using only Napa Valley grown grapes and allowing the wine to secondary ferment in the bottle. When we arrived the winery was quite crowded, but we were quickly seated on the patio. Their system for handling visitors is simple and makes the tasting process very personal. Basically you choose a table, and then the wait staff handles your wine order – answering any questions or suggesting flights. It’s like being at an outdoor café. Another nice policy is that they serve each wine with an associated coaster that contains the label of that wine. It makes it much easier to remember each wine. We sampled four wines, the Reserve Brut, Cuvee M Red, the Grande Annee, and the Sparkling Pinot Noir. Each of these wines retail for $30 and were excellent – flavorful with small bubbles. The Reserve Brut was as dry as its name suggests, but also fruity (white cherry) with a slight vanilla finish. It is a 60-40 blend of Pinot Noir and Chardonnay aged three years on lees. The Cuvee M Red is a unique blend of Pinot Noir and a little Syrah. This is a dark red wine, which tastes a little like a sparkling elderberry wine that’s a little spicy. The whole Pinot Noir berries are soaked for five days to extract the color and flavors, and then fermented with the skins pressed off after fermentation. A Syrah-based liquor is added to each bottle after disgorgement. The result is one of our favorite sparkling wines and one of the winery’s best sellers. The 2001 Grande Annee or “Great Vintage” is only produced when the winemaker determines that the grapes will age perfectly. The 2001 vintage is another 60-40 blend of Pinot Noir and Chardonnay and is aged 5 years on lees, then another 3 months after being disgorged. This is a complex wine, with honeysuckle aromas and a vanilla finish. The mid palette is a jumble of differing tastes. It truly deserves the Double Gold at the 2007 California State Fair Competition. The final wine was the Sparkling Pinot Noir, another red wine with a slight plum and cherry flavor. For some reason this was our favorite; it was quite out of the ordinary – like a true Pinot Noir with fizz. If you are unable to tour Napa, Mumm Napa’s sparkling wines are generally available throughout the country. They are extremely affordable and great values. While cruising Highway 29, we frequently passed an interesting line of trees bending over a driveway with a chateau inspired building in the rear. Our curiosity was finally relieved when we drove under the Sycamore tress into Peju Province Winery. Without even tasting the wines Peju became one of favorite destinations. The grounds are awesome, with multiple fountains, sculptures, gardens, and even a small creek. We toured the estate for at least 45 minutes before venturing inside the tasting room, which itself, is housed in a pretty cool building: the Peju Tower. The building is composed of stucco and stone and interestingly, the posts and beams are made of lumber salvaged from old Midwestern barns. In the early 1980’s, Anthony Peju and his wife Herta Behensky (HB) decided to enter the wine industry and searched for the appropriate location throughout California. They found the perfect location in Rutherford, purchasing an estate of vineyards that included 60 or more year old Cabernet Sauvignon and French Colombard. Location was the key, since the estate bordered the existing Robert Mondavi, Inglenook and Beaulieu enterprises. They then turned to creating the proper tasting room that they envisioned as well as creating the fantastic landscaping we saw today. Upon entering the tasting room, we were greeted by very friendly hosts who help facilitate a trip to the bathroom during a bad potty training episode. They were completely understanding. Afterward we were guided into the main tasting area where a large stained glass window greeted us. This magnificent window was created a century ago and depicts “the three Greek graces in a beautiful garden”. Whatever that means. Our official tasting was in the Uluru Room, or The Addition, which shares the stained glass window with the main tasting area, but also has a quartzite tiled floor and silk lamp shades. A very unique look. We started out with a nice Estate Bottled Chardonnay from grapes grown in the Persephone Vineyard. The wine was aged in French Oak which gave it texture but not a buttery finish. The wine was quite refreshing – but not as interesting as their Provence, a proprietary blend of Cabernet Sauvignon, Merlot, Zinfandel, Chardonnay and French Colombard. This is the type of unique wine that makes wine touring interesting – since it is probably not stocked in many retail stores. The wine is dry, yet fruity and refreshing which explains why it was the wine of choice for a few couples picnicking in the gardens. And after the tasting, this was the most popular wine purchased by our fellow visitors. After the Provence, we moved to the full-bodied Bordeaux reds, starting with the Estate Bottled Napa Valley Merlot. Even though the wine was aged 16 months in oak – it is a very smooth and fruity wine, probably due to the extra 10 months aged in the bottle. From this tasting and a few previous, it’s nice to see Merlot still prevalent among established wineries. The Napa Valley Cabernet Sauvignon was also aged a year and half in oak and is a full-bodied wine. It has an intense dark cherry flavor with a slightly spicy finish – we describe a lot of cabs that way, don’t we. In any case, we like this wine, but even more the Napa Valley Cabernet Franc. It had a stronger cherry flavor and seemed smother than the Cabernet Sauvignon. In sum, the wines are excellent – another winery where each offering was suburb. Add in the architecture and you have one of our favorite places. After a fulfilling late lunch at Taylors (try the meatball sandwich and coconut milk shake), we explored the back roads of Howell Mountain in order to allow someone to sleep in the car. After an hour driving, we got the urge to visit another winery before the 5:00 o’clock closings. While driving from the Silverado Trail to Route 128 we came upon a sign for Silver Oak Cellars and charged ahead. And found a construction site. Actually, the winery is being completely reconstructed after a fire destroyed the historic dairy barn where the winery was located. The new winery\tasting facility is expected to be completed by the end of the summer. In the meantime, the tasting room is housed in a temporary – but spacious – trailer. Upon entering the facility we found a very different enterprise than those we had visited earlier. Over thirty five years ago Ray Duncan partnered with Justin Meyer (then the winemaker at Christian Brothers) with the idea to make wine from a single variety: Cabernet Sauvignon. And not just a typical Cabernet that’s tannic content requires several years of aging. They wanted to produce a wine with “fully developed flavors and a velvety soft texture on the day it is released for sale”. In order to do so, they purchased vineyards in two premier appellations (Napa and the Alexander Valley) and developed a partnership with a Missouri cooperage to ensure a steady supply of high quality American oak. Over the years they manipulated the blends within the appellations and between new and used oak to produce duo of wines that evidently have a large following. Mr. Meyer selected Daniel Baron to succeed him as winemaker and eventually sold his shares back to the Duncan family. With several years working experience in the Bordeaux region, Mr. Baron’s experience further contributes to the Silver Oak Cellars philosophy. We were both relieved and surprised to find only two wines awaiting us in the tasting room. After a day of tasting, we were starting to tire of wine, so we figured we could handle two more. On the other hand, we have never visited a winery that had this few offerings. Interesting. We started with the 2003 Alexander Valley Cabernet Sauvignon, made from 100% Cabernet Sauvignon from several Alexander Valley vineyards. The irony of finding an Alexander Valley wine in Napa the day after traveling specifically to Alexander Valley and finding mostly Napa grown wines was not lost on us. The wine is aged in 50% new and 50% once-used American oak barrels for 25 months, and then spends another 15 months aging in bottle. The wine has a full black cherry flavor that lasts throughout – from the nose to the tail. This wine is a fine example where wineries should serve beef cubes while tasting – it must pair well with beef. The 2003 Napa Valley Cabernet Sauvignon was actually a Bordeaux blend of 78% Cabernet Sauvignon, 13% Merlot, 7% Cabernet Franc, and 2% Petit Verdot. The wine is blended than aged in 100% new American oak barrels approximately 25 months, and then spends another 20 months aging in bottle. No need to store this wine; drink immediately. This is a smooth wine that is probably worth its steep price ($100). It is neither fruit forward or earthy, but rather a nice combination of the two. Even though this wine appears a little spicier than the Alexander Valley wine, it seems to be more drinkable on its own – without a meal – and even during a hot day. We enjoyed this wine – an instant classic. And good luck to Silver Oak Cellars on this reconstruction. After leaving Silver Oak, we decided to drive once more along Route 29 near Rutherford, before finishing our last day in Napa. Along the way we noticed that Alpha Omega Winery was still open. Why not one more. The winery is a little over a year old and the permanent tasting facility is still under construction. We walked around the front after our tasting to examine the new facility and it will be impressive – particularly the large deck\patio that overlooks the lake. For now, the temporary tasting area is located next to the fermenting tanks. Who cares, the wines were great. Winemaker Jean Hoefliger has crafted wines in several styles that we really enjoyed. Unfortunately, we lost our tasting notes of the session – probably left behind in the rental car. The rest is based strictly from memory. Alpha Omega was offering two white wines, a few red wines, as well as a rosé styled wine – finally a few white wines to finish our trip. Both the 2007 Napa Valley Sauvignon Blanc and 2005 Napa Valley Chardonnay were very nice; both refreshing with the Chardonnay fruity not “oaky”. The Sauvignon Blanc will be very popular once the deck is finished – we can envision spending an afternoon basking in the Napa sun. The 2007 Napa Valley Rosé was a hit – a dry wine with a strawberry flavor and an acidic finish that popped in the mouth. It’s nice to see this wine style being offered along with the full bodied reds. As for red wines, we tasted the 2004 Napa Valley Cabernet Sauvignon, and 2005 Napa Valley Proprietary Red. The Cabernet Sauvignon was jammy, while the Proprietary Red was earthier – but they both were very drinkable now. We were also privileged to sample the 2006 Napa Valley Proprietary Red in the barrel. This will be a great wine – already smooth and earthy. We were ready to drink directly from the barrel all day. We will keep an eye open for when this wine is bottled. After a long week of tasting, our trip was over; time for fireworks and sleep in order to catch an early flight in the morning. Thanks to everyone we met for their hospitality and for making this a wonderful experience. As always, see the Compass Tours section at Wine-Compass.com for pictures. Today we started the last day of our trip and our only full day in Napa on the Silverado Trail. This road runs parallel to Highway 29, is less crowded, and most importantly is home to many excellent wineries. One of these is Stag's Leap Wine Cellars, where we intentionally started the day. If you have been keeping track of our tour, you will not be surprised to learn that this winery is included in the Paul Lukacs book "The Great Wines of America: The Top Forty Vintners, Vineyards, and Vintages ". The wine that led to the inclusion in the book: The Stag's Leap Wine Cellars S.L.V. Cabernet Sauvignon, which won top red wine at the 1976 Paris tasting. What made it more remarkable is that this wine was the very first vintage from Stag's Leap Wine Cellars and the vines that produced the fruit were only three years old. How’d that happen? According to the winery, “In 1969, Warren Winiarski tasted homemade Cabernet Sauvignon from Nathan Fay's vineyard on the eastern side of the Napa Valley and knew he'd found a place capable of producing wines as classic and expressive as France's greatest vintages. In 1970, Warren and his family established their S.L.V. vineyard on land next to Fay's and began their winery, Stag's Leap Wine Cellars, in early 1972.” A few years later, the Paris tasting – and then international recognition for producing “elegant Cabernets”. In the mid 1980’s they were able to purchase the famed FAY vineyard so that now they produce reserve wines; one from this vineyard, the second from the famed S.L.V. vineyard, and CASK 23 – a proprietary blend produced from the two vineyards and only during exceptional years. By the time we arrived at Stag's Leap Wine Cellars, the tasting room was already crowded – at 11:00 am. We started with the regular tasting of the Napa Valley Collection which consisted of the Napa Valley Sauvignon Blanc, KARIA Chardonnay, Napa Valley Merlot, and the ARTEMIS Cabernet Sauvignon. The Sauvignon Blanc was one of the best we tasted – more like the true Bordeaux blend with the addition of the aromas from the Semillon. It is a refreshing wine, nice acidity – with a slight grapefruit flavor. A good start to the day. The KARIA Chardonnay has the chardonnay flavor expected from the variety, with a slightly creamy finish. The wine was aged 9 months in used French oak – so that finish is soft – not buttery. Fortunately this wine is widely available on the East Coast. The Napa Valley Merlot is a medium-bodied wine that is extremely smooth for a wine that has been aged a year and a half in French oak. The nose is all vanilla, with strawberry flavors and a slightly pleasant spicy finish – not a peppery finish. Finally, the ARTEMIS Cabernet Sauvignon is the full-bodied red – aged 16 months in French oak – that is both fruit forward (black cherry) – yet spicy and buttery at the finish. That must be how they describe a wine as complex. While driving to Stag’s Leap Wine Cellars we passed an Alamo-ish villa painted exclusively white so after that tasting we backed tracked to visit Chimney Rock Winery. The winery was founded by the Anthony Terlato in 1980 with the goal of producing artisan wines of "first-growth structure, style and taste". Since the geography of the Stags Leap District encourages slow ripening fruit and richer flavors, their vineyard selection was a good start. The winery also created the "Fletcher Lyre" trellising system which creates smaller, richer grapes. The result is wines that have scored consistent 90+ ratings from major publications. But are the wines tasteful for the average consumer? The Chimney Rock estate is a beautiful place to visit, from driving through the gate - to the tasting facility – and finally the lazy waterfall in the courtyard. Without tasting the wines, we enjoyed sitting on the patio as our son played with his toys on the waterfall. The patio was also crowded as other families and couples stayed after sampling the wine. As for wines, we started with the Elevage Blanc a blend of Sauvignon Blanc and Sauvignon Gris. There was nothing wrong with this wine, except it just happened to follow Stag’s Leap Wine Cellar’s version on the itinerary. And we preferred the later. On the other hand, the 2005 Cabernet Sauvignon and Elevage (Bordeaux blend of Cabernet Sauvignon, Merlot, & Petite Verdot) were very comparable to those produced at Stag’s Leap. The Cabernet Sauvignon had a blackberry flavor with a smooth vanilla finish, whereas the Elevage had more chocolate flavors – yet just as smooth. Back East, one of the best viniferia wines is Cabernet Franc so we were excited to be able to experience a West coast version at any opportunity. Unfortunately, that opportunity was rare, so thankfully Chimney Rock had two offerings, the 2005 Cabernet Franc and the Rosé of Cabernet Franc. The winery usually doesn’t produce a single varietal Cabernet Franc, but the yield from the 2005 harvest was so ideal, there was enough juice for just such a product. Like the Elevage, this wine had a hint of chocolate that complemented the black cherry flavor. Very nice. The Rosé of Cabernet Franc was the first of a few rosé styled wines we tasted for the day and this one was quite different. Usually rosé wines have a strawberry flavors but this one was more of dark fruit – plum and cherry – and more aromatic. The acidity makes this a refreshing dry wine as well. If we didn’t have to move on, this would have been the wine to drink on the patio. See the Compass Tours section at Wine-Compass.com for pictures. During our wine country door, by the end of each day and definitely by the end of the week, we could not force down another glass of wine. So in the evening and occasionally at lunch we would sample the local beers. We were surprised at the number and caliber of available locally produced beers. The first we tasted was from the Lagunitas Brewing Company, located in Petaluma. Our favorite of theirs is the Czech Style Pilsner, followed by the India Pale Ale. If you like hoppy beer, then try the Bear Republic Brewery’s Racer 5. We tried this beer at their brewpub in Healdsburg. Fortunately, beers from both of these breweries are available at our local beer source: Norm’s Beer & Wine. Another good microbrew, and where we had a fabulous meal, is the Calistoga Inn Restaurant & Brewery. We had the Wheat Ale – it was excellent with their paella. If you find yourself in Napa Valley driving along Highway 29, visit the Silverado Brewing Company in St. Helena. Or head south to Napa and have a meal at Downtown Joe's American Grill & Brewhouse. We couldn’t get in the door to this establishment during the 4th of July celebrations. There may be other good brews from the area; we’ll take another look next time. We had an early afternoon appointment at Ridge Vineyards - Lytton Springs so we headed north on State Road 128 crossing back into Sonoma County and traveling through some of the nicest countryside we had seen: the Knight and Alexander Valleys. Don’t miss this drive – its one of the best in the area. We arrived and were greeted by David Gates, the winery’s vineyard manager since 1989. Most of Ridge’s operation is located in Cupertino – near San Jose – but in the early 1990’s they purchased the Lytton Springs vineyards after purchasing its zinfandel since 1972. They eventually built a tasting room to take advantage of Sonoma tourism. Today the vineyard contains primarily Zinfandel with smaller amounts of Petite Sirah, Carignane, Mataro – which we learned is an alias for Mourvèdre, and Grenache. Ridge Vineyards is also included in the Paul Lukacs book, "The Great Wines of America: The Top Forty Vintners, Vineyards, and Vintages ", for its Monte Bello Cabernet Sauvignon. This wine also participated in the 1976 Judgment of Paris tasting and for the 30th Anniversary of the event, it was select tops overall from a panel of American and British officials. Obviously it ages well. Unfortunately the winery was not pouring this wine, no need to waste a wine with a $175 price tag. Mr. Gates also explained that many wines are not poured in tasting rooms because not only do wineries lose by not gaining the income from wine poured for free, but that they also have to pay taxes to the federal government for each bottled wine – regardless whether the bottle is sold or poured at the tasting room. That is one reason that has increased the use and price in tasting fees as wineries attempt to recoup the taxes paid to Uncle Sam. While reviewing their tasting sheet the immediate benefit that we noticed was that the tasting offered a good sample of wines from various California appellations as single site wines. Besides Lytton Springs and the Monte Bello Vineyard in the Santa Cruz Mountains, Ridge owns vineyards in Geyersville, Paso Robles, Pagani Ranch (Sonoma Valley), and York Creek (Spring Mountain – Napa County). We started with the 2006 Chardonnay Mikulaco – from grapes grown in the Santa Cruz Mountains. We really like this wine – Chardonnay flavors throughout – and one of the most affordable at $25. The next was also a Santa Cruz Mountains wine, the 2005 Estate Cab – a blend of Cabernet Sauvignon and Merlot. This is another wine they recommend aging – but after already aged 21 months in American Oak – it’s ready now. It has a strong fruit flavor and a smooth finish for a wine aged that long in oak. We moved next to several Zinfandel wines, starting with the 2005 Lytton Springs, a blend of Zinfandel (77%), Petite Sirah (17%), and Carignane (6%). This composition of grapes has become somewhat of an industry standard for Zinfandel based wines and for good reason. The blend produces excellent wines and the Lytton Springs is no exception. At the same time this wine is full bodied, yet fruity and smooth. At $35, we wish it would only fit our daily budget. The same could be said for their 2006 Geyserville a similar blend with only different percentages of the same grapes, plus a little Mataro. The wine spends 14 month in the barrel and feels a little stronger than the Lytton Springs. Still, it’s very smooth. The 2006 Zinfandel Paso Robles is a 100% varietal that is aged 13 months in the barrel. The wine is slightly spicier than its brethren, but possesses a strong cherry flavor. Another 100% varietal was the 2006 Carignane Buchignani Ranch. This is the first 100% Carignane that we have tasted and we were immediately impressed and at $24 this wine is more affordable than the Zinfandel. Its fruity and young – let it sit awhile after opening. The final wine we tasted was the 2005 Syrah Lytton West - a red wine that includes 6% Viognier. The Syrah was aged 21 months so it’s a strong wine – I guess the Viognier adds to the aroma and maybe contributes to the spicy finish. This wine is very drinkable now – and would love to pair with food. After our tasting, David took us on a vineyard tour where he showed us the various zinfandel and petite sirah plantings. That day he was also overseeing new plantings of vines in another part of the vineyard, which he had to return to. In parting he suggested that we visit Bella Vineyard’s wine cave so off we went. While driving to Bella Vineyards we got our first look at Dry Creek Valley and its narrow roads, hilly terrain, and vineyards throughout. A great area to bike. We knew nothing about our destination, except for oral directions. Afterward we learned that during the 1990s, Scott and Lynn Adams toured the wine country frequently, got married in the area, and eventually, partnering with family members, purchased the current estate in 1999. The couple quickly began immersed themselves in vineyard management and wine making and after almost 5 years – the winery was operational. The tasting room resides in a cave, excavated in 2003, carved into one of the rolling hills on the estate. When we arrived we found a very popular winery – perhaps the most crowded tasting room to date - and several interesting red wines. It finally dawned on us that white wines were definitely in short supply in Sonoma County and Bella was not alone in producing only red wines. We first tried the 2006 Dry Creek Zinfandel; a wine with black cherry flavors. We experienced firsthand how the same grapes grown in different vineyards helps create dissimilar wines. For the next wine was the estate vineyard’s 2006 Lily Hill Zinfandel from 90 year old vines located above the cave. This wine tasted of blackberries, was more fruit forward with an especially smooth finish. This was our favorite of the day – we could have easily sat on the hillside, or in the cave, and finished off one of these bottles. While the first two wines were fruit forward, the second two were earthier. The 2006 Sonoma County Syrah is produced from grapes from the Lily Hill estate and Sonoma Coast vineyards. It had the most distinct nose of all the wines with a strong full bodied flavor and spicy finish. The 2006 Lily Hill Petite Sirah had more of a plum flavor with a peppery finish. It was nice to be able to taste another 100% Petite Sirah since Foppiano Vineyards and we will be searching for this varietal back east. The final wine was the 2007 Late Harvest Zinfandel. This was our second dessert wine on the trip – we figured that late harvest wines are scarce since the grapes were just too valuable to let sit on the vines. This one had a cherry flavor, and was sweet – not gritty, just sweet. Maybe this sweetness was our perception from just drinking several dry full bodied reds – we are not sure. In any case – this is a winery to visit. And in the meantime, search for their 2006 Lily Hill Zinfandel. Since we enjoyed the drive through Alexander Valley, we decided to return to Napa via that route and if possible visit another winery. We had previously spotted White Oak Vineyards & Winery and its Mediterranean-style buildings and arrived just minutes before closing. The tasting room employees merrily greeted us and as we tasted the wines, we learned more about the winery’s history. After a career as a building contractor and salmon fisherman, Bill Myers relocated to Healdsburg in the 1970’s. He purchased a vineyard from proceeds from selling his fishing boat and purchased a vineyard in the Alexander Valley. Winemaking soon followed. Over time he gained a reputation for producing quality Chardonnay, Zinfandel, and Sauvignon Blanc. In 1997 he expanded his vineyard capability by aligning with Burdell Properties, who purchased vineyards in Napa Valley and the Russian River Valley. A little later the existing tasting room was built, surrounded by seventeen acres of Zinfandel vines first planted approximately eighty years ago. Although we were hoping to try an Alexander Valley supplied wine, we started out our tasting with two Russian River Valley whites, their Sauvignon Blanc and Chardonnay. Finally, some white wine. The Russian River Valley Sauvignon Blanc is now the winery’s signature wine; it is a refreshing wine with nice acidity and citrus flavors. This is your wine for a hot afternoon. And priced at $16 well within our budget. The Chardonnay has more of an apple flavor with a slight oaky finish. This is a good wine – it should fare well alone or with a meal. The first round of reds were big wines from Napa Valley grown grapes: a Syrah, Merlot, and Cabernet Sauvignon. The wines were all very good, but we preferred the Merlot above the others. It had a cherry-chocolate flavor and a tail that lasted through the next sip. And at $24 it is very reasonably priced – maybe the best bargain in the area. Since we were hoping to taste an Alexander Valley wine, our courteous reps poured us samples of the 2005 Estate Zinfandel and the 2004 Estate Reserve. BTW, this is a very relaxed group. They came out to play with our son and were overjoyed when a couple strolled in with their two small dogs. Getting back to wine, the Estate Zinfandel was very smooth – slightly spicy – but smooth. Although it had a full-bodied fruit flavor it was also a bit earthy; another great Zinfandel. White Oak Vineyards & Winery was a great final stop for the day. Great wines, good company, and a fountain to play in. We started our day by crossing over the mountains for our first wine venture into Napa. We had visited Calistoga the previous evening to see the Old Faithful Geyser and Petrified Forest and to explore the northern Napa area. We came upon Castello di Amorosa - an immense castle hidden from St. Helena Highway. The Open sign was still displayed on the highway at 7:00 PM – so we ventured in, only to see the castle closed. Our son was excited for the chance to tour a “real” castle so the next morning we headed out early – knowing we had an appointment back in Sonoma that afternoon. After crossing the draw bridge, his and our excitement quickly faded into bewilderment when we were informed that children were not allowed on the premises. “What, you got to be kidding.” “Nope” was the reply. So we headed almost directly across Route 128 for the best next thing: a tram ride up to Sterling Vineyards. And our greeting would be the complete opposite. Sterling Vineyards was founded in 1964, a good year, by Peter Newton who was one of the first to plant Merlot and Chardonnay in large quantities in Napa. The winery was finished 8 years later, 300 feet above ground and painted entirely white to mimic the buildings in the Greek island of Mykonos. So that workers and visited didn’t have to “climb” to the hilltop, a tram was installed – which shuttles visitors and workers continuously to the top. In the late 1970’s the winery moved from a family enterprise into the corporate realm with Coca Cola purchasing Sterling, then to Seagram a few years later and eventually to Seagram’s parent Diageo. But even with this corporate ownership – the winery still maintains a family environment. When we arrived at the tram entrance we found that other families had gotten the hint – and that the tram was expensive: $20 per adult. That explains the $5 discounts we saw advertised in several brochures. Fortunately the long line moved quickly and our son’s excitement – particularly when informed we would have to return on the tram as well. The $20 ticket also included a tasting of 5 wines and a self guided tour of the facilities. What’s nice about the tour is that you can set your own pace – we hurried through – and Sterling had positioned stations at the beginning and end of the tour to taste wines. They start with the Cellar Club Pinot Gris and end with the Cellar Club Viognier. The last was very good – a good representative of the few Viogniers we encountered in California. The remaining three wines are poured on a veranda overlooking the picturesque Napa countryside. Immediately after we sat down a representative arrived with a juice box and coloring book for our boy. This reception may explain the couple play-groups in line ahead of us. We receive a pour of their Cellar Club Syrah. The day was already scorching so it was not a good environment to assess this red wine and the Rutherford Cabernet that followed. However, the Cellar Club Malvasia Bianca nailed it. Sterling is one of a few wineries to vinify this Italian variety and they make it off dry. It is a delicious wine, if one can be described as such – with refreshing acidity and a honey\nut flavor. If we didn’t have to move on – we would have kicked back with a bottle. Instead we had to move on to our next visit in order to stay on schedule. A Sterling Vineyard tram operator had recommended that before leaving the Calistoga area we needed to visit the Chateau Montelena Winery in order to view the Chinese inspired gardens. Perfect for a Kung Fu Panda obsessed youth. The winery was already on our list to visit since it was recorded as one of America’s top 40 wineries in the Paul Lukacs book "The Great Wines of America: The Top Forty Vintners, Vineyards, and Vintages " and produced one of the wines that won best overall wine at the famed 1976 Paris Wine Competition. The one that gave Napa wines an international reputation and forever raised the price of California wine. We decided we had a short amount of time to spare so we raced ahead. From the driveway, there did not appear to be anything impressive about the Chateau. The tasting room entrance looked like a one story building with the only semblance of a Chinese garden being a small Koi pond at the entrance. Looks are deceiving. We ventured around back to see that the section viewed from the front was actually the top of the structure, with the rest hidden below a slope. Quite an impressive building. A little further along the gardens exposed themselves with ornamental bridges and an array of water life: swans, ducks, turtles, and even a crayfish. The winery even stocks bread for visitors to feed the water fowl. Half our team stayed behind to feed the animals while the remaining ventured inside. Chateau Montelena was founded in the late 1880’s when Alfred L. Tubbs purchased land he thought suitable for vineyards at the base of Mount Saint Helena. Over the next decade he tended the grapes, built the chateau, and hired a French winemaker and opened in 1896, operating as a truncated form of the neighboring mountain: Chateau Montelena. By Prohibition the winery was one of Napa’s largest producers, but production ceased entirely as the Temperates gained power. The Tubbs family continued to tend the vines and sold the grapes to home winemakers and other wineries with the repeal of Prohibition – but eventually sold the estate to Yort and Jeanie Frank. The Franks excavated Jade Lake as part of creating a remote retirement sanctuary. Eventually James Barrett led a team that cleared and replanted the overgrown vineyard and in 1972 wine production resumed at Chateau Montelena. Four years later the winery was a member of the contingent of California wineries to send wine for a grand tasting at the Inter-Continental Hotel in Paris. Six California Chardonnays competed against 4 white Burgundies in a blind tasting by French officials. You can read here how these officials rated the Chateau Montelena 1973 Chardonnay above all the other wines. The strength of the winery is also displayed in the fact that it was their Estate Cabernet Sauvignon, not the Chardonnay that Lukacs featured in his book. The tasting room was already crowded early on this Thursday afternoon – with many visitors travelling from San Jose to start their day at the Chateau. The winery’s history and achievements are on display so venture down the hall to receive a more complete history of the operation. Fortunately for our time allotment, the winery was pouring only a handful of wines and we opened with the famed Napa Valley Chardonnay. The wine is made without malolactic fermentation since there is no need to soften the wine. It is more fruity than earthy with a lemon-honey feel. This was an instant favorite. The winery recommends aging for a more mineral feel – it you have the patience. We like the wine as is. The other white was the Potter Valley Riesling and this was a good representative of the variety. In fact, it may have been the only Riesling we tasted on the trip so it was nice to find one of our favorite varietal wines. It had the characteristic Riesling flavor with a refreshing acidic finish. Perfect for a hot day like today. He first red we tasted was the Estate Zinfandel, a medium – full bodied wine full of black fruit. This wine was actually earthy and with low tannins – extremely smooth. The Napa Valley Cabernet Sauvignon was more full-bodied with black cherry flavors and actually less spicy than the already smooth Zinfandel. This is another wine that they recommend aging. The last wine was the famed Montelena Estate Cabernet Sauvignon and this is a dense wine – almost like chewing plums or black cherries. The finish is a smidgen spicy with low tannins for such a big wine. At this price, $125, we don’t often find the opportunity to sample this caliber of wine – but it is truly one of the best cabs we’ve tasted. No wonder the consistent 93-94 ratings. Chateau Montelena Winery is a must visit for any visitor to northern Napa. The wines are truly outstanding and allocate enough time to explore the Chinese gardens. Thanks again to Castello di Amorosa for not allowing children; otherwise we may have missed this gem. We have been fans of Foppiano Vineyards since we tasted there wines and heard their unique history at the 2007 Washington D.C. Food & Wine Festival. For Foppiano Vineyards is Sonoma County's oldest continually owned family winery, having operated since 1896. Thus, we made sure we started our day at this historical site. After emigrating from Genoa, Italy, Giovanni Foppiano failed to strike it rich mining for gold, so instead he purchased a working winery and started supplying wine to Italian families locally and in San Francisco. His son, Louis A. Foppiano, joined the operation and eventually purchased the franchise in 1910. Apparently father and son had differing visions. During the next decade, the winery flourished and the vineyard expanded as new grapes were planted. One of these was Petite Sirah, which would become the winery’s trademark wine. Then Prohibition hit. Since individual could still make 200 gallons of homemade wine, Foppiano stayed in business by shipping grapes east and by switching to other fruit for the local market. The winery retained its previous vintages and probably supplied the black market. But 6 years into Prohibition, the Feds finally realized the winery continued to posses wine and raided the facility. They released 100,000 gallons of the 1918 vintage into the neighboring creek. Since it was still lawful to consume wine, people from miles around raced to collect the wine for personal use. By this time Louis J. Foppiano had ascended the mantle after Louis A. passed in 1924. The Foppiano tasting room contains a picture of Louis J. sitting under a Federal Agent next to the creek, with one wine consumer passed out on the other side of the red river. When the Volstead Act and prohibition were repealed in 1933 Louis J, resumed operations and headed east in search of new markets and distribution channels. His efforts succeeded and by “1941, Foppiano Vineyards was sending six rail cars a week to the east coast filled with wine, and increased its production to over 800,000 gallons of wine annually.” The winery sells a miniature Lionel version of one of these rail cars – which we added to our train collection. A few years later Louis J. helped create the Sonoma County Wine Growers Association as California started gaining a winemaking identity. After conquering the jug wine market in the 1950’s the winery switched to more premium grapes as growers in the Central Valley were more cost competitive. New grapes were planted in the vineyard, with only the Petite Sirah remaining. From that time, Foppiano has slowly gained recognition for producing premium red wines and their Petite Sirah “is known nationwide as one of the country's top Petites year-in and year-out’. Louis J. passed the helm to son Louis M. and today, in his 90’s still resides near the winery. Louis M. shares he family affection for the Petite Sirah and was one of the leaders in forming the PS I Love You, Petite Sirah advocacy organization. With his sister, Susan Foppiano Valera, he plans to continue this family legacy into the next century. When we arrived at 10:00 – yes they open that early for tasting – the winery was busy bottling and cleaning. A few other visitors were also trickling through, but the tasting room was relatively free so that the tasting room representative could give us his complete attention. We skipped the Pinot Gris and headed straight to the 2006 Russian River Valley Pinot Noir. This is a jammy cherry wine throughout, with a slightly toasty finish. This would be an interesting wine to compare with a Willamette Valley Pinot. Next up was the 2004 Russian River Valley Merlot. This is a full bodied wine – with more of a blackberry flavor than cherry. Vanilla is very noticeable at the finish. One of our favorites was the Lot 96 Bin 002 NV; a blend of Sangiovese, Petite Sirah, Zinfandel, Carignane, Merlot, Cabernet Sauvignon, and Cabernet Franc. This is a smooth fruity wine and priced at $12, this is a great value everyday drinking wine. The 2004 Russian River Valley Cabernet Sauvignon was similar to the Merlot in body and at the finish – although a little spicier at the tale. We last tried the 2005 Russian River Valley Petite Sirah – and again more blackberry than cherry. The most interesting part is the slight chocolate flavor at the finish. We thought we were through, but then the tasting room representative announced to the room, “Happy early 4th – here’s a library tasting of our Petite Sirah”. We tried the 2001 Russian River Valley Estate, 1988 Sonoma County Petite Sirah, and the 1994 Russian River Valley Estate Petite Sirah. What a bonus. The wines were still full bodied but incredibly smooth; with the 1994 Estate wine being our favorite of the three. We were getting ready to leave when Louis M. Foppiano volunteered to walk us through the vineyard – discussing the family history and showing off the Petite Sirah vines. What a great visit; thanks to everyone at Foppiano Vineyards. Leaving Foppiano, we headed a couple miles south on Old Redwood Highway to J Vineyards and Winery. This winery was founded by Judy Jordan, whose family also founded Jordan Vineyard & Winery. J Vineyards is known for their sparkling wines so we were eager to visit. Entering the winery is also a bit confusing since they share a driveway with Rodney Strong Vineyards. Just look for the signs. The grounds and tasting room were quite impressive which created a new concern as we worried how they would react to our son being present. This concern quickly dissipated when our tasting represented pulled out a can of apple juice, animal crackers, and a miniature wine bottle filled with. Boy, is this winery prepared for children. Thank goodness. Although we don’t really get modern design and architecture – J Vineyards tasting room was comfortable – even with this style. The design behind the tasting bar was especially interesting. With our son occupied with food and bubbles, we started tasting, beginning with the sparkling wines. These wines are made “Methode Champeniose” where they sit, not 2 or 3, but 4 years on lees. The result is awesome sparkling wine - tiny bubbles, fruit flavors - nice acidity. We tasted the J Cuvee 20 (in honor of their 20th anniversary), the J Brut Rose, and the 1999 J Vintage Brut. The last was our favorite, made from Russian River Chardonnay. These wines are slightly pricey ranging from $30-$50 – but well within the range for excellent sparkling wines. Changing to white still wines, their J Chardonnay Russian River Valley is one of the few oaked chardonnay wines that we have tasted. It’s creamy, with good texture – but not overly buttery. The fruit still dominates. Our favorite white was the J Viognier Alexander Valley. We tried both the 2006 and 2007 vintages and noticed several distinctions between the two which makes it interesting to taste a vertical series. The 2007 is fruitier with a vanilla finish, whereas the 2006 is creamier. Both are excellent. Moving to reds, J Vineyards offers several Pinot Noirs, a Zinfandel, and even a Pinotage. The latter was a good interpretation of the variety. The wine was slightly smoky, but not to the extremes as made in South Africa. Sometimes with these versions you wonder if you are drinking a coastal Scotch. The Zinfandel was also different than the spicy versions made in Amador and Lodi – its fruit forward with a blackberry flavor and slightly vanilla finish. Finally, the Pinots were very good. The Russian River Pinot Noir is a blend from 5 vineyards and interestingly the nose is very peppery – but not the flavor or finish. Instead you get cherry. We next tried the J Pinot Noir Nicole’s Vineyard which our rep described as masculine and the J Pinot Noir Robert Thomas Vineyard which she described as feminine. We agreed with her assessment, but for some reason preferred the Thomas Vineyard version. We ended our session by tasting the J Ratafia dessert wine; a blend of several varieties included Pinot Meunier and fortified with brandy. This is a great dessert wine – it tastes like peaches and apricots with a nutty finish. And this was one of only three wines that we purchased the entire trip. J Vineyards was extremely accommodating during our entire visit – which probably lasted over an hour and a half - just in the tasting room. If you are traveling to Sonoma with children, this is one winery you must visit. And for those without children, come to sample and excellent array of sparkling and still wines. Our final winery visit of the day was to Limerick Lane Cellars, the only American producers of Furmint wine. The winery has also built a respectful reputation producing zinfandel wines. Plus, Limerick Lane is located in the same southern Healdsburg local as the first two wineries. The winery started over twenty years ago when Michael and Tom Collins and their friend Ted Markoczy, purchased a run down 30 acre vineyard on Limerick Lane. They resuscitated the existing vines, planted new vines and razed and cleared land for a new winery. After producing a Sauvignon Blanc wine at a custom crush facility, they decided to concentrate on the variety best suited for their terrior: Zinfandel. Their first vintage was bottled in 1993 and immediately recognized as an “an exemplar of the finest California Zinfandel”. In the meantime Michael Collins also travelled to the Tokaj region in Hungary and returned with Furmint and Hárslevelu cuttings. The results of this endeavor is posted here, but needless to say we were excited to try their Furmint wine. When we arrived we were fortunate that winemaker, Ross Battersby, was pouring wines that afternoon. Mr. Battersby joined Limerick Lane in 1997 after working at Stonestreet Winery. There are not many in Sonoma with his interested background either. The U.K. native has an Honors degree in Agricultural Economics, worked as a safari guide in Africa, and moved to Berkeley to manage an international adventure travel company. That proximity to Sonoma and Napa raised his interest in wine and many years later we meet him at Limerick Lane. We started the tasting with the zinfandel, the Collins Vineyard Deco Zin and the Collins Vineyard Zinfandel. Both were produced in the Russian River Valley style that we have come to appreciate on this trip: fruit forward cherry and raspberry flavors with just a hint of vanilla. And completely smooth. The difference between the two is that the Collins Vineyard Zinfandel is a blend of Zinfandel grapes from throughout the estate with the average age of the vines being about 50 years. On the other hand the Deco Zin is produced from a lot of 74 year old vines. Some of the grapes from this lot also go into the Collins Vineyard Zinfandel – but the initial selection comprises the Deco Zin. We have become complete converts to Russian River Valley Zindandel. And also Russian River Valley Pinot Noir. Limerick Lane produces their version, the Orsi Vineyard Pinot Noir. If you prefer the big bold, high alcohol pinot noirs, this wine is not for you. Instead it is medium bodied – and I hate to use the adjective – but silky smooth and somewhat earthy. A European wine. The winery also produces a European style dry rose in the Rose Sec. This is a 50-50 blend of Zinfandel and Syrah – also from estate grown grapes. The wine has a strawberry flavor and out of the few rose styled wines offered on our trip, this was one of the best. We finally came around to the NV Late Harvest Furmint a blend of the 2002- 2004 vintages. The wine is made in the Tokaji Aszu fashion at approximately 3 puttonyos – with 6 puttonyos the sweetest. Please see Dezel's Virginia Vine Spot for another good overview of Tokaji Aszu. The wine was golden as expected and tasted just like the Hungarian version: apricots and honey. The one difference is that Limerick Lane’s version has a slightly nutty finish – whereas the last Tokaji Oremus Aszu 5 puttonyos that we tasted was all apricot from start to finish. Look for a later posting for a live comparative tasting between Limerick Lane’s NV Late Harvest Furmint and a couple Hungarian 3 puttonyos dessert wines. Limerick Lane Cellars is a must visit for any tourist to Sonoma County. For one, there is no place in the United States where you can taste a Furmint wine and perhaps their dry Furmint would be available during your visit. Their Zinfandel wines are outstanding as well and the Rose and Pinot Noir. Apparently their Syrah is not too shabby either. Plus the staff, as displayed by Mr. Battersby, are extremely courteous and entertaining. Traveling with children. You should see how quickly their winemaker fixed broken Kung Fu Panda chopsticks using a cork and a rubber band. We started our first day in Sonoma overwhelmed, staring at the Russian River Valley winery brochure and its listing of over 100 wineries. We eliminated the wineries which were open by appointment only - but still had quite a few to choose from. We decided to start at the closest open winery to our hotel in Sebastopol: Martin Ray Winery. The winery is historically significant because it is the oldest winery in continuous operation in Sonoma County and one of the oldest wineries in California. The winery started in 1881 as the Twin Fir Winery, then changed ownership to the Martini family and operated as Martini & Prati from 1902. The winery remained operational during prohibition by shipping sacramental wine to New York. For during prohibition it was not illegal to drink wine, only to produce wine with a certain alcoholic content. And religious organizations received waivers. Thus Rabbis in New York would receive an allotment of sacramental wine and deliver it door to door for the sabbath. Sneaky. But it helped the winery continue operations. Five generations of Martinis ran the facility until Courtney Benham acquired the winery in July 2003 and renamed it Martin Ray Winery. Martin Ray is also interesting because they obtain grapes from other vineyards even though there are hundreds of acres of vineyards surrounding the property. These vines are leased to other wineries. Instead the winery produces three series of wines from different appellations throughout California. On our visit, we stuck with predominately the Martin Ray and reserve series. For the white wines we tried the Mendocino County Pinot Gris, Angeline Winery Russian River Valley Sauvignon Blanc, and Russian River Valley Chardonnay. The Sauvignon Blanc was excellent with a citrus flavor from beginning to end. And priced at $14, this wine has great value. The Chardonnay was our favorite white, slightly creamy with vanilla flavors that doesn't overwhelm the fruit. For reds, we tried their regular offerings, which were good (Santa Barbara County Pinot Noir), but they quickly took a back seat to the reserve tasting. These wines were awesome, particularly the Diamond Mountain District Cabernet Sauvignon. The Stags Leap District and Santa Cruz Mountains Cabs were also extraordinary. When visiting Martin Ray, the additional $5 for this reserve tasting is well worth the cost. In Napa, you'll be paying 5 times that for equivalent wines. During this tour we are also noting how friendly the wineries are towards adults visiting with children. And Martin Ray was more than friendly. A tasting room representative came out and played with our son and his blocks. This allowed us to taste without constantly looking over our shoulder. Thank you. On all accounts Martin Ray Winery was a perfect start to the day. From Martin Ray we traveled a couple miles to Martinelli Vineyards for no other reason that it was close and open. We quickly learned that the Martinelli family has been growing grapes in Sonoma County since 1887. In that year Giuseppe and Luisa Martinelli planted a small vineyard on a 60 degree slope, which later became known as Jackass Hill vineyard, because only a jackass would plant on that steep of a slope. And today, this vineyard is still the steepest planted vineyard in Sonoma County. Their son Leno took over operations, followed by his son Lee Sr. In 1973 Lee Sr. and his wife Carolyn took the next step and starting producing wine from their highly sought after fruit. They converted two hop barns into a production facility and tasting room, and with the help of consulting winemaker Helen Turley, Martinelli Vineyards was operational. Lee Jr. and George Martinelli joined their parents as the fifth generation of the Martinellis working in the wine business. During our visit we sampled several wines that were truly amazing. The "Tessa Lee" Sauvignon Blanc possess apple and citrus flavors and with the nice acidity, this is a refreshing drink. The chardonnays were even better. The Martinelli Road Chardonnay is awesome. The grapes are harvested from a vineyard just below the original Jackass Hill Vineyard and is one of the coolest sites in the Russian River Valley. Even though the wine is aged 10 months in new French oak, the wine remains fruity. At this point of our trip, this is the best Chardonnay we've tasted, ever. The Zio Tony Ranch Chardonnay was not too far behind - it has a similar fruit flavor with a spicy longer finish. The reds were equally impressive. The "Bella Vigna" Pinot Noir was fruity with strong cherry flavors and a slightly spicy tail; whereas the "Vigneto di Evo" Zinfandel is what all Zinfandel wines should taste like. Its fruity but not overly spicy. In fact there is very little spice, just layers of fruit. An excellent wine and visit. Our final stop for the day before heading to Safari West, was Hook & Ladder Vineyards & Winery. In 1975 Cecil and Christine De Loach began producing wine after seeing other wineries produce award winning wines from their old vine Zinfandel. For the next thirty years they make wine under the De Loach label, which they sold a few years ago. Having also produced a wine under the trademarked Hook and Ladder label, the family started anew as the Hook & Ladder Vineyards & Winery. This name also honors Cecil De Loach's years as a San Francisco firefighter. Upon entering the tasting room, we quickly saw that this venue is child friendly. A toy fire engine rested next to barrels and an open carpet awaited our toys. Now to examine the 15 wines available for tasting. Their selection is truly interesting from white and red blends to a dry Gewürztraminer and White-Zinfandel. The last two are very interesting wines. The Gewürztraminer has .7% residual sugar and contains the usual spiciness associated with the variety. We understood why it was the winery's second best seller. The White-Zinfandel is also made dry, with just a hint of sweetness. Otherwise, its just strawberry flavors. Hook & Ladder also makes two good chardonnays, The Estate Grown RRV aged half in oak and half in stainless steel. There is just a hint of vanilla in the finish as the chardonnay grape takes charge. The "Third Alarm" Estate Bottled RRV is creamier from aging in 100% French Oak. The red wines were even better. The RRV Pinot Noir is made from the top 10% of grapes with the remaining grapes sold as juice. This wine is marketed as a food friendly wine, but we liked it solo. The Zinfandel Estate Grown is a blend from different vineyards and is smooth as any Zin we've tasted. It also has a slight chocolate aroma that makes it even more interesting. Then there is the "Third Alarm" Reserve Gambogi Ranch Zinfandel made from vines planted in 1909. Another good zin. Our favorite may have been the Station 10 Zinfandel a blend of Petite Sirah, Carignan, and Alicante Bouschet. The winery's best seller is "The Tillerman" a blend of Cabernet Sauvignon, Cabernet Franc, Merlot, and Sangiovese. This is a smooth wine at a value price: $17. Our favorite red was the "Third Alarm" Cabernet Sauvignon, aged 22 months in French and American oak. Its big, but not overpowering. With this large selection, there is something for everyone - and for us - we liked it all. Today, June 30th, we finally ventured out of San Francisco and headed north to wine country. We traveled over the Golden Gate bridge and headed west to the Point Bonita Lighthouse at the mouth of the San Francisco Bay. Overlooking the intersection between the bay and the ocean, this lighthouse offered excellent views of the rough seas, seals sunning on the rocks below, the Golden Gate bridge, and San Francisco. Our next destination was Muir Woods and the coastal redwoods. This park was the 7th National Monument, having been granted this status by President Theodore Roosevelt in 1908. It was also the first national monument created from land donated by a private individual, thanks to William and Elizabeth Kent. Slightly smaller than Sequoias, the coastal redwoods are still impressive - the tallest close to 258 feet. The most amazing part of the groves is the sunlight as it moves between the trees and the brush. Leaving the redwoods, we traveled along Highway 1 following the coast, through several switchbacks that were sometimes dizzying. Driving past Stinson Beach and Bolinas we finally reached our first winery at Point Reyes Station: Point Reyes Vineyards. The winery is owned and operated by Steve and Sharon Doughty, who also operate the neighboring dairy farm. The couple planted their vineyard in 1990 and soon after opened the first tasting room in Marin County since the 1930's. The majority of grapes grown at the estate are Cabernet Sauvignon and Pinot Noir - the later used in the Estate Pinot Noir and Blanc de Noir. The remaining grapes are sourced from either other vineyards in Marin County or from Sonoma County. We tried several of their still wines, the Quail Hill Cabernet Sauvignon series being our favorite, but the sparkling wines were worth the drive. The wines are made in the "Method Champeniose" style aged on the lees for 3 years, with the 1992 Brut Cuvee aged 10 years on the lees. The Non-Vintage Blanc de Blanc was good, refreshing and fruity - but we liked the Non-Vintage Blanc de Noir even more. This wine seemed slightly drier, but as refreshing. And priced at $24, both these wines are affordable sparkling wines. 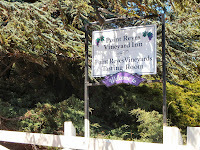 We left Point Reyes Vineyards with some Blanc de Noir and continued north into Sonoma County. We wanted to start our Sonoma tour at the mouth of the Russian River and that took us to Jenner. This area was first explored and populated by Russian fur trappers, who navigated the river and used the surrounding hills for grazing their livestock. Today Jenner is a small community that specializes in kayak tours of the area. Particularly when the seal pups are exploring the river - as we saw while eating dinner at River's End Restaurant. This restaurant is worth a trip in itself with great food, a superb wine list, and "breathtaking" views of the area. An excellent end of the day.